Omari Grant was just fooling around in the wooded area behind his Henry County, Ga., home like a normal 11-year-old boy, conspiring to build a tree fort with his friends. However, things took a frightening turn when a neighbor called the police to complain about the boys cutting the trees, WSB-TV reports. One officer arriving at the scene pulled a gun on the fifth-grader and his friends. "All he could get out at the time was, 'Mom, he had a gun in my face, Mommy. 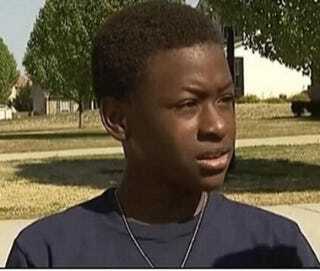 Mommy, he had a gun in my face,' " Omari's mom, Janice Baptiste, told the news station. She says the young boy was crying. According to Omari, the officer used bad language and made him and his friends lie on the ground and spread their legs. "As if they were robbing a store," Baptiste added in disbelief. "I was thinking that I don't want to be shot today, so I just listened to what they said," Omari told the station. The husband of the neighbor who called the police was just as stunned. "Yeah, that's pretty shocking to hear that a gun was pulled on a child," Edgar Dillard said. According to Dillard, his wife only called the police because "there were falling hazards, tripping hazards, all types of hazards, so number one was concern for the children and concern for the environment." Baptiste found the actions intolerable and has since filed an excessive-force complaint, prompting an investigation by the Henry County police department into the case. The officer, whose name has not been confirmed, is still working while supervisors attempt to get to the bottom of the case. "If it was justified, then we'll deal with it. If it wasn't, we'll address it as well," Sgt. Joey Smith told WSB-TV.